Getting started at speed skating does involve some planning and preparation. First, learn how to ice skate.It is not necessary to purchase speed skates immediately. It is best to learn basic ice skating skills while wearing figure skates or ice hockey skates. Register and take some ice skating lessons.Most ice arenas offer weekly group lessons that usually run from six to twelve weeks. These group lessons cover many ice skating basics. Register for speed skating lessons and/or find a speed skating club.Call your local ice arena and inquire about speed skating lessons and programs. U.S. Speed Skating has produced a Speed Skating Basic Skills Manual and provides speed skating lessons through the U.S. Figure Skating Basic Skills Program. Purchase speed skates and protective equipment.Once you are part of a speed skating club, get recommendations on where to purchase speed skates that fit your needs. Speed skates can be very expensive, but it may be possible to purchase used equipment. Practice.Those new to speed skating practice at least two to three times a week. As a racer advances, more practice time is necessary. 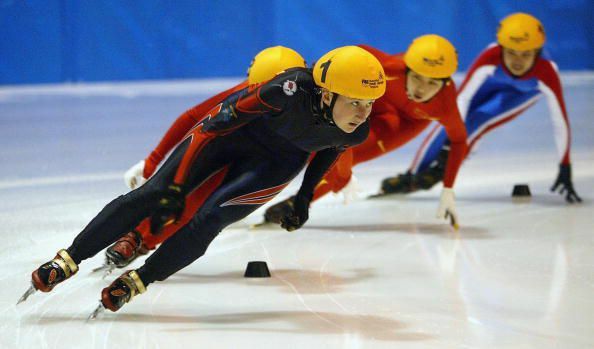 Participate in speed skating races and events.Your speed skating club and coaches will keep you informed about speed skating races and events. Participate in races as much as possible. Speed skates are not necessary at first but should be purchased eventually. Protective gear such as helmets and gloves. A skin-tight racing suit will eventually be necessary. Some racers wear neck guards and protective goggles.